The door opens and the innkeeper kicks a couple of old sacks aside and pulls some extra straw from a loft and leads the donkey to another corner of the room. He throws a rough wool blanket at the young couple and hold out his hand for a payment. He rubs the coin and stalks away. He rushes out the door and almost runs into the innkeeper’s daughter. She is twelve years old and had crept round to see the couple staying in the stable. The oldest of six, she had seen her mother grow as big as Mary. And she knew that the time was close. She held a second blanket in her hands and offered it to Joseph as he came stumbling out. Joseph ducks back inside to tell Mary then leaves with the innkeeper’s daughter. Mary is alone in the stable. She pushes back into the straw, adjusting the blanket, waiting for the next contraction, waiting for the birth, alone.The glory of the angel’s visit is nine months old. Immaculate conception – human birth. The midwife knocks and enters. Joseph shuffles in the straw in the corner rubbing the donkey’s muzzle for comfort, watching the messy miracle of a new born world. The baby cries. As do we all. Life breaks through. Redemption is born. The pain is not over yet, but recreation has begun. I hear the baby’s cry. Life arrives and I partake with grateful heart. 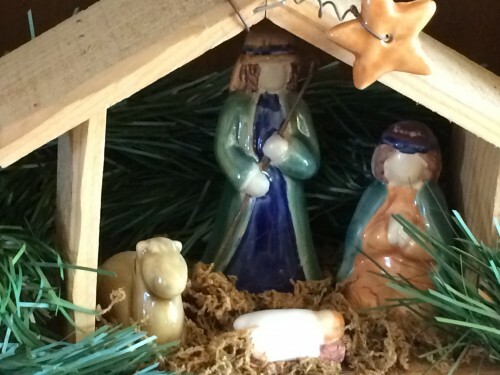 This entry was posted in soul stories and tagged gratitude, hope, meditation, nativity, stories by celia. Bookmark the permalink.